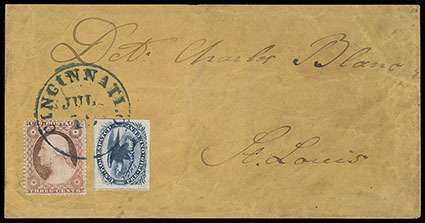 Carrier, 1851, 1¢ Eagle, four large margins, tied in combination with 1857 3¢ dull red by bold blue Cincinnati, O. cds on cover to St. Louis, cover bit reduced at top & flap missing, adhesives with trivial corner crease, Very Fine and attractive. Scott No. LO2 Estimate $150 - 200. 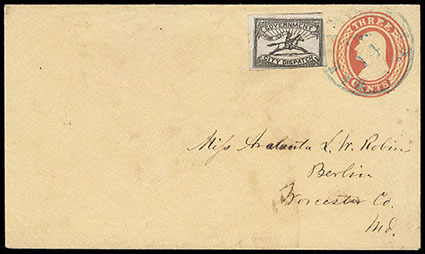 Baltimore, Md., 1857, 1¢ black, "Sent" variety, position 7, slightly cut in, tied to 1853-55 3¢ entire by blue Baltimore cds paying 1¢ carrier fee to post office on entire used to Berlin, Maryland, minor flap tear, Very Fine, variety rare on stationery cover, especially when tied, ex-Judd. Scott No. 1LB8a Estimate $150 - 200. 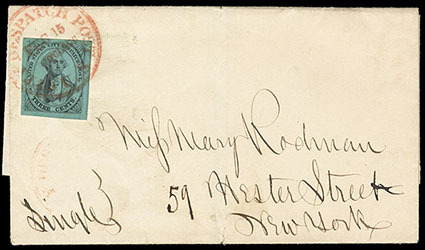 New York, N.Y., U.S. City Despatch Post, 1842-45, 3¢ black on blue green, four large margins, trivial paper crack at top right corner (not mentioned on clear certificate), tied by neat red "City Despatch Post, Feb. 15" cds on outer folded lettersheet, cover with small tear at bottom, lovely Extremely Fine appearance; with 2016 P.F. certificate. Scott No. 6LB5 Estimate $300 - 400. Philadelphia, Pa., U.S.P.O. 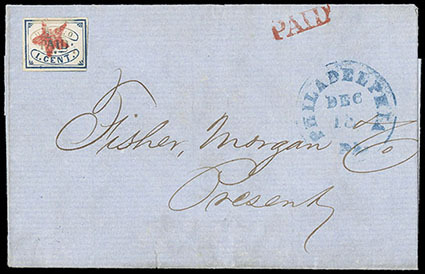 Despatch, 1850-52, 1¢ blue, large margins to just touching at bottom right, cancelled by bold red star and acid wash, on local cover with matching red straight line Paid with blue Philadelphia cds alongside, Very Fine and attractive, ex-Gibson. Scott No. 7LB12 Estimate $200 - 300. 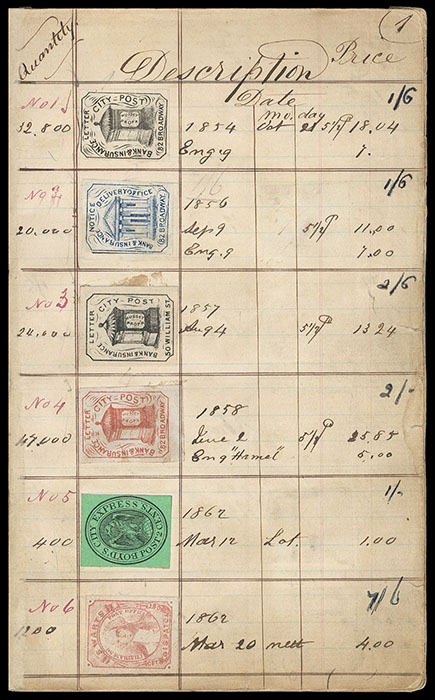 Postage Stamps Printed For George Hussey, From 1854 to 1866, By Thomas Wood, New York, 85 Nassau St., the original Thomas Wood printers ledger of stamps made for George Hussey from October 21, 1854 to June 25, 1866, containing 233 local post, bogus local, carrier and Postmaster Provisional reprints and forgeries, each numbered with quantities printed and costs, in leather bound 36 page ledger (4¾x7¼''), with special binder case made in 1966 to house the ledger, Very Fine. THE UNIQUE THOMAS WOOD PRINTERS LEDGER FOR REPRODUCTION STAMPS MADE FOR GEORGE HUSSEY. 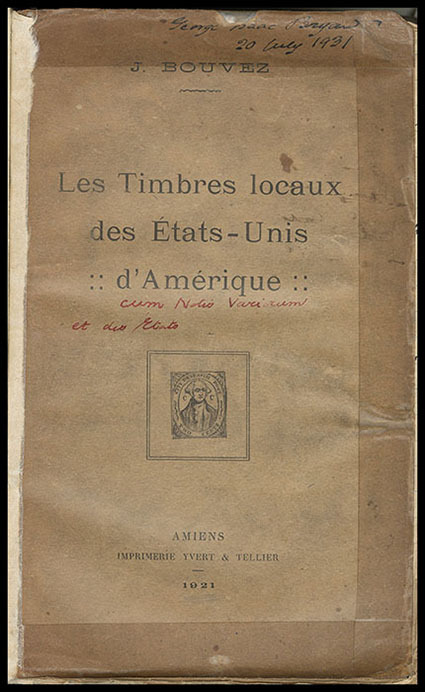 Byant, G. U.S. Local Posts and Confederate Provisionals, 1931-43, a meticulous 297 page critical review hand written by George Isaac Bryant of Les Timbres Locaux des Etats-Unis d'Amerique by J. Bouvez written in 1921 of which its 88 pages are also present, with over 100 local post forgeries tipped in, this unique 5¾x9" hand authored book was rebound in 1966 by last owner with matching slipcase, Very Fine, one of the most comprehensive historical research studies on carriers and local of its time. 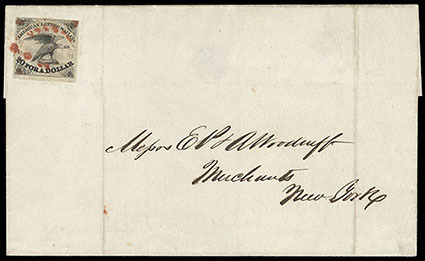 American Letter Mail Co., 1844, 5¢ black, thin paper (2nd printing), clear to large margins, tied by red stars in oval handstamp on folded letter sheet to New York, March 30, 1844 docketing, Very Fine; with 2008 P.F. certificate. 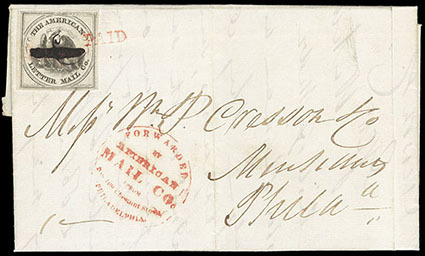 American Letter Mail Co., 1844, black on gray, full to large margins, bright paper, cancelled by manuscript "C" and pen stroke, tied by red "Paid" handstamp, matching red "Forwarded by American Mail Co. from No. 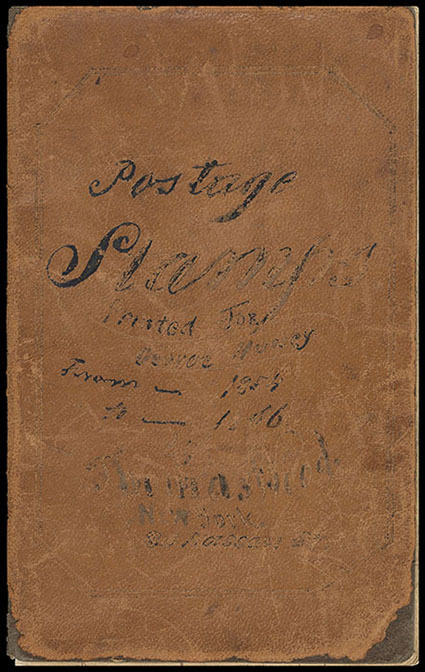 109 Chestnut Street, Philadelphia" circular handstamp on Aug. 29, 1844 folded letter to local Philadelphia merchant; light file folds, Very Fine and early use. 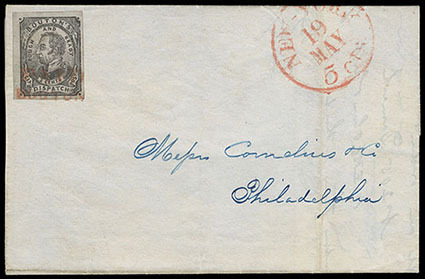 Bouton's City Dispatch Post, 1848, 2¢ black on gray blue, ample to large margins, tied by red "Paid Bouton" handstamp on folded letter sheet to Philadelphia, Pa., red "New - York, 5 cts., May 19" integral rate cds, letter and docketing of May 19, 1847 which would make this the earliest known usage of this stamp, Very Fine; with 1974 A.P.S. certificate. 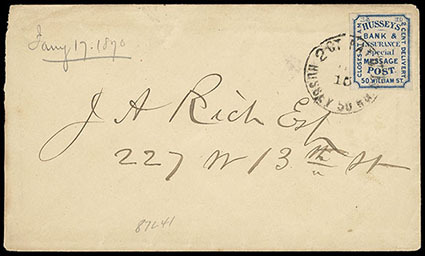 Hussey's Post Group, of nine covers; includes local usages of Scott #87L38, 87L41, 87L51, 87L61, 87L73-87L75, two stampless with different style oval handstamp, also includes a receipt for 300 Stamps signed by Hussey with bold "Special Message Post" handstamp (only 5 recorded), Very Fine overall.